Either we are going to get on the euphemistic plantation/reservation boxcars on their way to hell or we are going to derail the entire damn train, and fundamentally change this hypocritical, filthy, unjust and corrupt U.S. political system. We can’t have it both ways simultaneously. This U.S. political system will not change of its own accord. It is WE who must change it! The systemic symbiotically-joined, corporate-owned Democrat and Republican parties have placed this nation, and the world, on the brink of environmental and nuclear annihilation. There comes a time when, we the everyday ordinary Black, White, Brown, Red, and Yellow people, must take collective responsibility for this sad and insane state of affairs. There comes a time when we must act together in and for our common interests, and stop allowing ourselves to be manipulated by the propaganda arm of the Democrat and Republican parties, i.e. by the corporate-stream media. We are either going to continue collaborating, to our own detriment and demise, with this corporate controlled U.S. Empire—or we are going to, once and for all, take our destinies into our own collective hands. We cannot eat the rotten cake of this corrupt political system while simultaneously honestly struggling for economic justice and human rights, at home and abroad. We must stop allowing this system to pimp us and and make hypocrites of us. We must stop fooling ourselves in this nation. The infamous, repressive, bloody, and unscrupulous U.S. government COINTELPRO activities against U.S. citizens have now morphed into the even more horrifying extrajudicial indefinite imprisonment provision of the so-called National Defense Authorization Act (NDAA) of 2012. The two party dictatorship of the corporate-owned Democrat and Republican parties, combined with the ‘Electoral College’ system and so-called ‘corporate personhood,’ have made ‘democracy’ in the United States an utter sham. 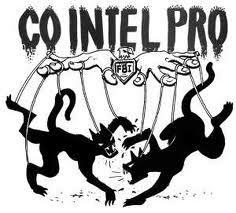 The horrors of COINTELPRO have been legally codified in the NDAA, which is now the law of the land. But so many people remain fast asleep. [Reference That was Then, This is Now: Cointelpro Today with Larry Pinkney] ‘Elections’ in this nation, particularly on the federal level, are an unmitigated farce of gigantic proportions. Think about it as if your life depends on it—for indeed it does! My brothers and sisters, we in this nation, are in very serious trouble. We can ill afford to collaborate with this two party corporate dictatorship of and by the Democrats and Republicans of the U.S. Empire. We must cease allowing ourselves to be the canon fodder of and for the Empire. We must cease allowing ourselves to be manipulated and pitted against the ordinary peoples of Africa, Asia, Europe, and the ‘Middle East,’ etc. We must take our collective destinies into our own hands, in our own common interest and that of humanity as a whole. It is time to consciously engage in this long and protracted struggle for real systemic change. Everyday people throughout Mother Earth are one family with many variations. If we “do not act,” we do not, in the words of Rosa Luxemburg, “recognize our chains.” If we do not act, we fail to understand and actualize our own enormous collective human power. If we do not act, we fail to heed the words of Frederick Douglass, when he said, “If there is no struggle, there is no progress.” Humanity’s struggle continues and intensifies. The choice really is ours. Think about it!